Just you two and the Minister on the Beach. FREE SMALL PHOTO SESSION. Great for Elopements, Vow Renewals and Small / Simple Wedding Ceremonies. 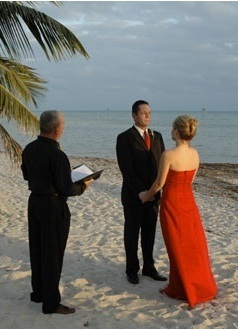 Wedding Officiate Services in Alabama or Florida. Non-denominational Ordained Minister. We welcome and accept all faiths and beliefs, and are comfortable in both religious and non-religious settings. We are always respectful to the wishes of our couples and are non-judgemental, open-minded, flexible and fun! 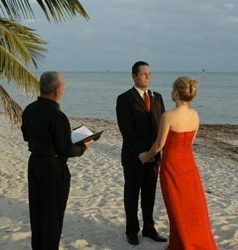 You may say your own vows or have for your ceremony our truly inspirational “Based on Love” vows. We have performed short and sweet civil ceremonies, religious ceremonies and interfaith weddings. We have years of officiating experience and are familiar with many cultural wedding traditions, including veil & cord, jumping the broom, wedding crowns, unity coin and lasso ceremony. We understand and respect the unique dynamics of each and every wedding ceremony. Sorry, this service is not available on Saturdays or Holidays. A non-refundable deposit will hold your date, this will vary depending the package. All balances are due a minimum of 45 days before the wedding date. Please choose the packages you would like more info on so we know how best to reply to your information request.